FREMONT, Calif.--(BUSINESS WIRE)--Optovue, the global leader in the development of optical coherence tomography (OCT) and OCT angiography (OCTA), today announced an expanded FDA 510(k) clearance for non-contact, quantitative measurements of the epithelial and stromal layers of the cornea, termed epithelial thickness mapping or ETM. The expanded clearance adds a nine-millimeter ETM scan to the previously available six-millimeter map, allowing for detection of epithelial irregularities in an area that is about two-and-a-quarter times that of the area covered by the six-millimeter scan. Optovue’s ETM, now available on the Avanti® Widefield OCT system, is the first and only FDA-cleared product indicated to provide corneal epithelial and stromal measurements that aid in the diagnosis, documentation and management of ocular health and diseases in the adult population. The measurement of corneal epithelial thickness is recognized by medical professionals as a vital part of assessing patients for refractive surgery and following post-operative recovery, as well as managing patients with progressive eye diseases and ocular surface disorders. 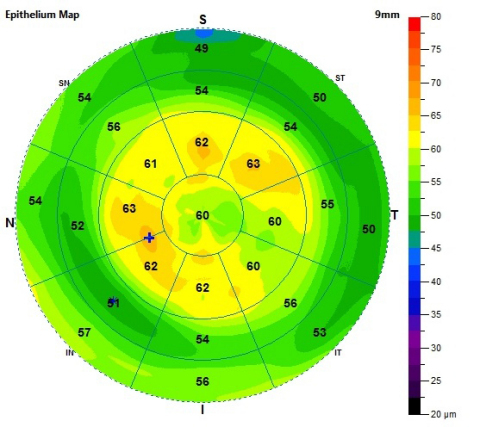 Optovue’s new mapping software provides epithelial thickness information in an efficient and simple exam. Traditional epithelial measurements require high-frequency digital ultrasound and saline. In addition, ETM software complements other diagnostic tests by providing unique information about ocular health that may be clinically valuable prior to topography-guided procedures including LASIK and PRK. ETM was previously cleared on the company’s iVue system in 2017. In clinical studies that evaluated ETM, disruptions of the epithelial layer were found in patients with all stages of keratoconus, a progressive eye disease in which the normally round cornea thins and begins to bulge into a cone-like shape. An irregular epithelial layer was also observed in dry eye disease, which affects nearly 20 million people in the U.S.1 If left undetected, these conditions could adversely impact refractive surgery outcomes. Pre-surgical assessment with ETM could help determine whether patients are suitable for refractive procedures. ETM also provides important information about how the eye is healing after refractive and corneal surgery. Optovue, Inc. is a privately held medical device company founded in 2003. Headquartered in Fremont, Calif., the company is dedicated to the advancement and commercialization of high-speed OCT and OCTA technology used to facilitate the diagnosis and management of eye diseases, many of which may lead to permanent blindness. Optovue is the first company to develop and commercialize the pioneering OCTA technology. To date, there are over 400 peer-reviewed publications detailing the AngioVue® OCTA imaging technology and clinical applications. The company has installed over 11,000 products worldwide. For more information, visit www.optovue.com.